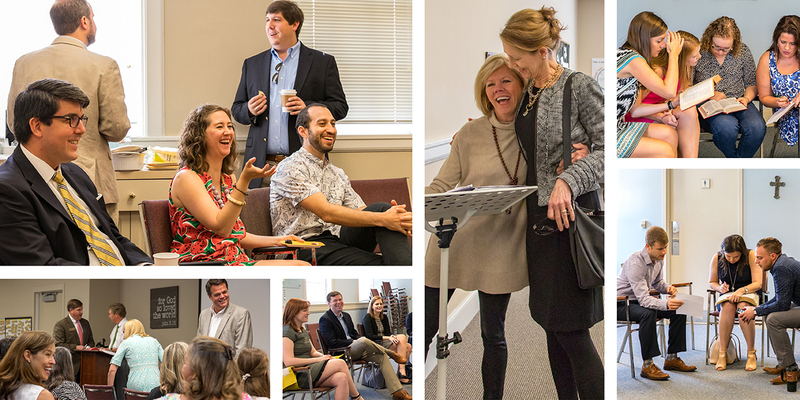 Adult Sunday School is the heartbeat of Peachtree Road. In a weekly small group, you can experience friendship, support and learning within the greater church community. Feel free to visit many different classes until you find the one that fits you best. Our hope is that you find your home in Sunday School at Peachtree Road. On Sundays, Ambassadors are available to help you choose and locate Sunday School classes that may be a good fit for you! You can find Ambassadors on the Sanctuary level in the Rotunda and the Adult Sunday School Building Lobby. For more information, please contact Elizabeth Byrd at 404.240.8270 or elizabethb@prumc.org. Young adults in the early stages of their career journey meet to strengthen their relationship with Christ, experience fellowship, participate in local outreach, and build relationships. Classmates or guest speakers lead the curriculum, which is formatted around a rotation of 3-6 week studies. Join other newlyweds and engaged couples for Bible study, outreach, and fellowship. Contact Kalle Wood at kallewood77@gmail.com for more information. A community of married couples with growing families. Rotating class members and guest speakers lead faith-based lessons and discussions on marriage, family, and work/life balance. This self-taught class of newly married couples and couples with young children enjoys community outreach, Bible study, and supper clubs. Their goal is to grow together as they move through the different chapters of their lives. Mostly empty nesters, ages 40 to 60 something, this class is highly socially connected with each other. There are weekly speakers or programs with no outside work required. This group of parents of school-aged children enjoy getting together to share their Christian journey. The unique class curriculum features a combination of both Bible-centric and topical lessons that are applicable to maturing families. This class studies a new theme each year with outside speakers as well as class members teaching. Lessons require no outside reading. Members are primarily mid 40s – mid 50s, but range from younger to older, and enjoy fellowship with 2-3 social functions each year. Parents of school-aged children focused on nurturing families who use a combination of speakers and class discussion. The foundation of this class lies in their strong faith and connection with one another. Most children are nearly grown, and loving support is provided to one another as God’s word is studied each week. Members of this class range in age from 30s to 50s with children from preschool to middle school ages, including families, couples and individuals at similar life stages. Members are on a journey of faith and fellowship to build strong Christian foundations. Discussion is facilitated by class members with a diverse curriculum and monthly speakers. Married couples, with and without young children, learn about building a strong Christian foundation for marriage. Curriculum is a mixture of Biblical discovery, current events, and traditional lessons led by class members and outside speakers. They have numerous social and philanthropic activities. Young families in their 30’s support one another as they focus on strengthening marriages, building Christian families, and growing together in faith. The curriculum encourages individual and family growth through weekly lessons, volunteer opportunities, and social activities. A friendly, caring group of marrieds and singles share life’s journey with intellectually stimulating classes and extra-curricular activities promoting fellowship and fun. This diverse class has members whose ages range from 40’s to late 50’s, single, divorced, and married with kids ranging from middle school to college. Optional homework includes buying the study book and reading a chapter or two for discussion. This energetic group of couples and singles, ages 50-70, has speakers each Sunday with a focus on a range of relevant and timely Christian topics. The class also participates in meaningful outreach opportunities and enjoyable social activities. Late 60’s-70’s+. Lessons consist of guest lecturers including the church staff. The class is involved in both local and international outreach as well as a couple social events each year. An active class still growing in faith through traditional Bible study led by regular teachers. This group of 70’s+ prefers a non-traditional class, with a myriad of topics, ranging from Old Testament to current events that have spiritual significance, usually with a different speaker each week. A caring and supportive group of single and married senior adults committed to the church’s beliefs, mission and outreach. Class includes a variety of speakers discussing spiritual issues, personal journeys, current events and other interesting and challenging topics. Several social events are enjoyed each year. Everyone is welcome to join us on Sunday mornings. Engages seriously in scriptural study through the Disciple Bible Study Curriculum. Classes are led by two teachers. A study book is required, and there are weekly reading assignments. New curriculum is introduced throughout the year, and newcomers are welcome to join at the start of each new course, as advertised. Bible-based study for adults who are committed to learning in and out of class. A group of individuals who meet weekly to talk about what it means to be Christian and how to put faith into action.